After conquering the financial world, John "Mac" McQuown ('57) set his sights on climate change by building a microgrid that's demonstrating what green tech can do. The man renowned for pioneering equity index investing has built a career applying analytics to the business world. He also credits serendipity with taking him from the family farm in Sandwich, Illinois, to Wall Street and leading him back to the countryside again. 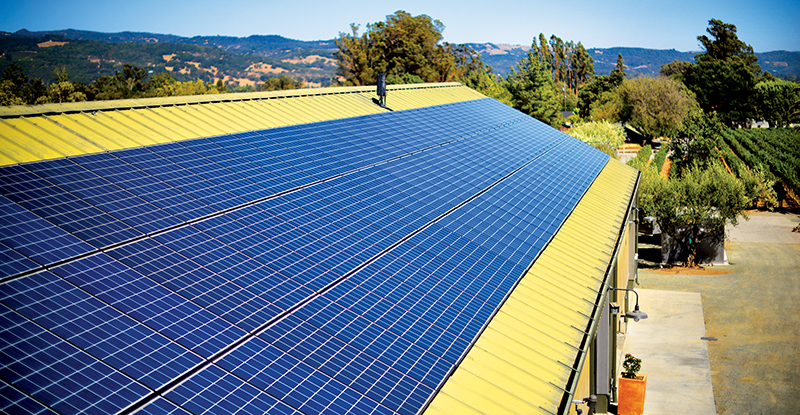 Today, the various roads of McQuown’s journey intersect in Sonoma, California, at Stone Edge Farm, home to his thriving organic vineyard and winery as well as his innovative microgrid technology testing ground. McQuown recently spoke with Northwestern Engineering about his commitment to the environment and how engineering thinking has guided him as he pursues his passions. McQuown’s connection to the environment began as a boy on the family’s 1,200-acre farm in Illinois. Owned by his parents and run by his aunt and uncle, the farm was short-handed during World War II while many of the men fought on the front lines. Young Mac was put to work as a farmhand at only eight years old. "I can tell you right now, that teaches you an awful lot about the environment,” he says. “It’s a complete hands-on kind of learning.” The sensitivity of his aunt and uncle to the farm’s ecosystem and their respect for the natural resources on which they relied had a huge impact on the young McQuown. Their philosophy of wasting nothing resonated with him. Intrigued by the machinery used on the farm, he decided to study mechanical engineering at Northwestern, becoming the first in his family to attend college. It was a class in corporate finance recommended by two of his Phi Delta Theta fraternity brothers that altered the course of his life and led to a celebrated financial and entrepreneurial career. Perhaps the most serendipitous moment of McQuown’s life happened when he walked into Professor Harry Guthmann’s corporate finance class. Instantly drawn to the topic, McQuown was intrigued by the intricacies involved in financing enterprises. He enjoyed the course so much that the textbook he used—authored by Guthmann—is still a cherished possession. McQuown was hooked. After serving two years in the US Navy, he earned an MBA from Harvard Business School and pursued a career in quantitative finance. He began working on Wall Street with Smith Barney & Co. in 1961 and was again disturbed by how much subjectivity went into investment management. Continuing to ponder the problem after joining Wells Fargo Bank in San Francisco, McQuown pioneered the use of data analysis to create the first equity index funds and launched a revolution in investing. The achievement earned him a place in finance history as “one of the architects of the modern investing system,” according to Bloomberg Markets magazine. McQuown went on to cofound Wells Fargo Investment Advisors, which is now part of investment management and financial planning firm BlackRock. Since leaving Wells Fargo in 1974, McQuown has used his data-driven approach to business to launch more than a dozen companies in the financial services, technology, and California fine wine industries. Successes include the corporate credit analytics firm KMV and investment management companies Diversified Credit Investments and Dimensional Fund Advisors. "The amalgamation of independent disciplines appeals to me, because a lot of the problems we have to solve are cross-disciplinary." 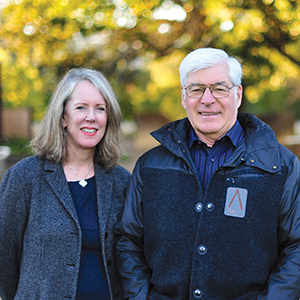 McQuown and his wife, Leslie, gifted funds to support Northwestern’s Institute on Complex Systems and its research into the complexity in biological systems, markets, and innovation adoption in workplaces. He’s also involved in Northwestern’s finite Earth research, one of the strategic themes identified by the University’s Global Strategy Task Force. Drawn back to the land in 1995 by his agricultural roots, McQuown and Leslie began purchasing the land that now makes up Stone Edge Farm. As he looked around their Sonoma, California, property trying to decide what to grow, grapevines seemed the obvious choice for the soil. With some industry experience under his belt from helping establish the Chalone Wine Group, McQuown set out to turn the property into a vineyard and winery. Today, McQuown is proud of Stone Edge Farm Estate Vineyards & Winery’s two Bordeaux-style wines: Stone Edge Farm Cabernet Sauvignon and Surround Red Bordeaux Blend. The 16-acre organic farm also produces olive oil and heirloom vegetables and has a restaurant. From the beginning, McQuown’s environmentalism and concern for climate change spurred him to make Stone Edge Farm sustainable and energy efficient. The respect for the environment he inherited from his aunt and uncle became part of the philosophy behind the farm. McQuown ranks contributing to a solution to climate change as his top personal goal. His years working the land as a boy and sailing the oceans in the Navy gave him a passion for conservation. Serving on the Scripps Institution of Oceanography Advisory Board instilled an appreciation for the urgency of the issue, and many of his philanthropic endeavors are directed toward it. McQuown and engineer Craig Wooster created the microgrid with the motto: “We prove the possible.” The idea was to create an “island” that can store energy indefinitely, access it instantly, and export it to the grid. The Stone Edge Farm microgrid has more than 20 distributed energy resources and nine different battery systems. In addition to solar panels, it also uses microturbine and hydrogen fuel cell technology. The microgrid generates clean electricity, reuses water, and creates fuel for zero-emission vehicles. In island mode, the microgrid can sustain the farm completely with energy to spare. There have been times during emergencies when it was the only functioning power in the area. Excess power is available to the local power company. The greater goal of the project is to demonstrate that clean energy solutions can power whole cities. Paid graduate student interns from all over the country come to study and contribute to the microgrid, and all intellectual property is open to free use. This year, the project received the California Governor’s Environmental and Economic Leadership Award. In April, Northwestern Engineering held an event—called the Symposium on Microgrids: Renewable Energy Microgrids for Sustainable Development—where leaders in technology and policy assessed challenges to microgrid development and discussed opportunities to overcome them. The event was inspired by McQuown’s work in the area. And while it may seem a world away from Wall Street, McQuown’s farm represents a cosmic coming together of many interests. He’s happy to share what they’ve learned there and encourages the students who will become tomorrow’s leaders of environmental and climate science to contribute.